In March 1974, the Hobie Hawk was released by the Hobie Model Co. of San Juan Capistrano California. Somewhere between 10,000 and 14,000 of these models were sold–many through the Hobie Cat sailboat dealers–not just hobby shops. "I did it the way I wanted too - each part used the best materials available for the specific application. It was a complete package and we had the capability to make the Hawk so we did. There was nothing else out there like it at the time, everything else was a balsa build up kit, I wanted to produce something much different, something that could take the punishment and was faster to build for the consumer... and yes, although the wing was complicated it was not difficult for us because of our background in the sailing and surfboard industry, foam core laminating was what we did." 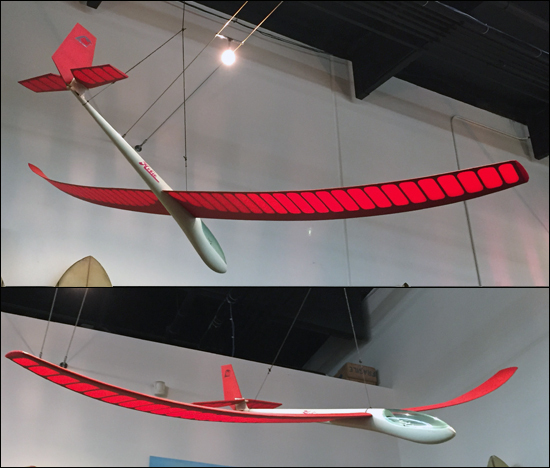 We now have a Hobie Hawk in the SHACC collection and it's on display in our showroom!